One of the number of things I am doing in Nepal is to help high school children from similar socioeconomic background as me attend UWC’s. 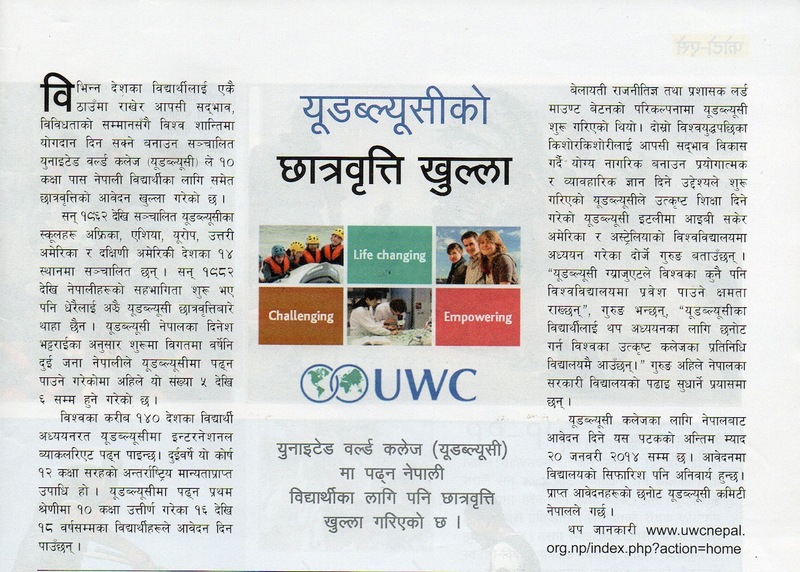 UWC scholarship article in Himal. Click on the image for the original. As a result, we had a number of government high school graduates from low socioeconomic backgrounds applying for the sole full scholarship–that from UWC Masstricht. Unlike in the past, the selection was conducted differently, adhering to the stipulation of the college, namely that the student come from a low socioeconomic background. Seven students made it to the final round. In the end, we offered the scholarship to Iju Regmi. Iju’s scholarship unfortunately, does not cover travel and personal expenses. Had my own scholarship to UWCAD not been a full scholarship paying for everything–including flights and pocket-money–I most likely would NOT have been able to go! Iju’s parents, like my parents then, cannot cover those expenses. She attend even her current intermediate school on a 70% scholarship! I have decided therefore, to run a fundraising drive to help provide that life-changing UWC experience to Iju. This is a personal initiative and has nothing to do with COMMITTED nor does it have anything to do with the Nepal UWC National Committee. However, a number of friends and fellow Nepalese UWC graduates–notably the usual suspect Subina–are assisting me. Deepa in Australia has also kindly offered to help. Another friend, who wishes to remain anonymous, has already pledged $500, while still another has promised to make a donation! Here are the details of her needs. 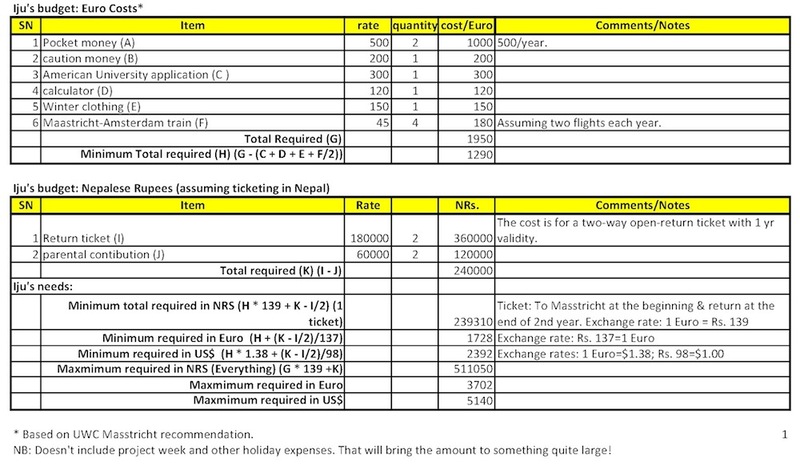 The minimum required to cover pocket-money, caution money (refundable deposit), two-way train journey between Maastricht and Amsterdam airport, and one return ticket–out-bound flight at the beginning and an inbound flight at the end of the second year–is about 1728 Euros (US$ 2392). If however we were to raise the necessary funds to cover the rest of the expenses, the need goes up to 3702 Euros (US$5140). My goal is to raise about US$2550, slightly more than the minimum, in order to cover fees and other charges. Should we end-up raising more even better! Iju starts school next Fall. Where and How Can You Contribute? Contribute through PayPal. Log into PayPal and send funds to my email address: dorje[underscore]dhindul[at]yahoo[dot]com. Option for donating through a crowd funding page will be added here should I find an appropriate one. I keep coming across one complication or another with every platform, but I am still searching and hope to find one. In Australia, please get in touch with Deepa (deepa[dot]rai[at]unisuper[dot]com[dot]au). If you do contribute, please let me know by dropping a comment underneath or an email to dorje[at]dorjegurung[dot]com. As and when the donations come in, I’ll be filling out the table below. We have our first donor. The time for Iju to begin her adventure is fast approaching. She will begin her UWC experience towards the middle of August. As such, we’ll need to arrange for her bank account and flights etc. I have thus decided to end this fundraising drive on June 26, 2014. We are short of just about US$700. If the Facebook pledge by Solangture for the AU$300 is taken into account, we are short of just a little over $400! I am certain we’ll be able to send Iju to Masstricht! But if you haven’t donated and want to, please do so! Thanks once again to all those that have already donated! I am happy to report that the balance has already been pledged! However, if you still wish to donate, you can do so as what I have raised here is just the minimum. A final contribution (of US$200) from a friend of a friend came in today! Ticket for Iju has been bought. She flies out in just a few days, on August 27! I have been in the process of transferring the necessary funds to UWC. Once everything is finalized, I’ll be sure to post the details of all the arrangements and expenses etc. Iju headed for Holland on Aug. 27, 2014. Click here for details of her account for 2014-15 academic year, and here for her account for 2015-16 academic year.